Gloria Rearte, president of the Brgy. Pulo Water System Association, receives the turnover certificate for the operations and maintenance of the water system project constructed under DSWD’s Kalahi-CIDSS program. Almost 500 households of Brgy. Pulo in San Antonio, Quezon now have a regular potable water supply after the completion of their water system sub-project implemented through the Department of Social Welfare and Development’s (DSWD) Kapit Bisig Laban sa Kahirapan-Comprehensive and Integrated Delivery of Social Services (Kalahi-CIDSS) program. DSWD Secretary Corazon Juliano-Soliman led the inauguration and turnover ceremony of the said sub-project to the residents of Brgy. Pulo last March 23. The water system, worth PhP1.49 Million, consists of a water tank, distribution lines and a central tap stand, which is an upgrade of the water well project implemented by the residents last 2013 through the same program. Gloria Rearte, one of the residents in Brgy. Pulo and a community volunteer, said that having a regular potable water supply helped lessen cases of diarrhea among children in their community. The residents formed the Brgy. Pulo Water System Association (BAPWASA), which manages the operations and maintenance of the sub-project. As the president of the BAPWASA, Rearte received the turning over of the operations and maintenance of the project from Sec. Soliman during the ceremony. “Lubos naming tinatanggap ang pamamahala ng proyektong ito at kami ay nangangako na aming pangangalagaan ang proyekto para sa patuloy na serbisyo at kapakinabangan nito sa pamayanan,” Rearte said. According to Sec. Soliman, the goal of the Department is to empower the people to work for and be part of the change. She commended the residents of Brgy. Pulo for making DSWD’s goal possible through their hard work and commitment to improve their community. “Tunay ngang nasa kamay ng mga mamamayan ang kaunlaran ng isang pamayanan. Kami ay patuloy ninyong kaakibat sa pagkamit ng pagbabago na ninanais nating lahat,” said Sec. Soliman. The water system in Brgy. Pulo is one of the 35 Kalahi-CIDSS sub-projects completed in the town of San Antonio since 2013. Other projects implemented in the town include farm-to-market roads, health stations and day care centers among others. A total of PhP38.70 Million grant was utilized for the implementation of these sub-projects. Since the start of Kalahi-CIDSS in Catanauan in 2010, a total of 214 sub-projects are implemented by the community residents and the LGU. Projects include farm-to-market roads, water system, health stations and day care centers among others. For someone who was given the opportunity to serve the town of Catanauan, Mayor Ramon Orfanel believed that he will take the responsibilities all to himself. This perspective, however, changed when he was introduced to a different approach in the local development process. “Bilang Mayor, ang alam ko lang dati ay ang salitang ‘I’ sa pagsasagawa ng mga proyekto sa aming bayan. But because of the thrust of Kalahi-CIDSS to empower the people, I have learned the power of ‘we’ in effectively improving the town of Catanauan,” said Mayor Orfanel. Mayor Orfanel pertains to the community-driven development (CDD) strategy of the Kalahi-CIDSS or the Kapit Bisig Laban sa Kahirapan-Comprehensive and Integrated Delivery of Social Services of the Department of Social Welfare and Development (DSWD). The program is geared to harmonize ordinary citizens and local government units (LGUs) to work together towards the development of their communities and implement projects that would best address their pressing needs. With the use of the CDD strategy, Mayor Orfanel believes that the town has greatly improved. “Ang Kalahi-CIDSS ay sagot sa kahirapan. Ang mga mamamayan ay nagkaisa at nagtulungan upang magkaroon ng mga proyekto na makakatulong para umangat ang antas ng kanilang kabuhayan,” he proudly said. When Kalahi-CIDSS started in Catanauan, Quezon Province in 2010, Mayor Orfanel admitted that he had doubts with the CDD process of the program. According to him, the Kalahi-CIDSS has an unusual strategy of project implementation, which fully engages the people and demands behavior change. Nonetheless, he put his trust to his constituents to embrace the process. He accepted it and made the residents feel that their voice is important in the planning, decision-making and implementation of community projects. According to Brgy. Capt. Jackelyn Rabi of Brgy. Cutcutan, Mayor Orfanel never misses Kalahi-CIDSS technical reviews of project proposals to listen to the reasons for the need of projects directly from the residents or community volunteers. He also provides assistance to community volunteers to help them meet documentary requirements. “Dahil 100% ang suporta ni Mayor, nararamdaman namin na mahalaga kami sa katuparan ng mga proyekto at pagpapaunlad ng aming barangay,” said Brgy. Capt. Rabi. Community volunteer Leonora Marquez from Brgy. Doongan Ibaba added that they are often encouraged by the Mayor. This, according to her, inspired them to keep going and work towards the completion of the project. “Palagi niyang pinapalakas ang loob namin at sinasabing ‘Kaya niyo yan!’ Kung baga, kahit kaming mga hindi nakapag-aral ay pinagkakatiwalaan niyang maisasagawa namin ang proyekto,” shared Leonora. As a result, the community residents were able to successfully implement their prioritized projects and, above all, they felt their worth in the community. “Napakasarap sa pakiramdam na makatulong sa kaunlaran ng barangay lalo’t higit na marami kaming natutunan, at nagawa ko ang mga akala ko’y hindi ko magagawa dahil hindi ako nakapagtapos ng pag-aaral. Bago ako bawian ng buhay ay masasabi kong may nagawa ako para sa kaunlaran ng pamayanan ko,” shared Estelito Hernandez, a community volunteer from Brgy. Camandiison. As he shares the gains of their town through Kalahi-CIDSS, Mayor Orfanel cannot help but take pride of what his constituents have become. “Nakaka-proud na ‘yung dating mga maybahay na mahiyain at hindi lumalabas sa kanilang mga tahanan ay nagiging kabatian ko na at nakakasalubong ko sa munisipyo dahil nagsasaayos raw sila ng mga dokumento. Sa tulong ng Kalahi, marami ang natuto at nagkaroon ng lakas ng loob na may magagawa sila para sa aming bayan,” the proud Mayor stated. He also mentioned that the efforts of the people throughout the five-year implementation of the Kalahi-CIDSS in their town resulted to a total of 214 projects that helped improve the delivery of social services in their communities. These projects include farm-to-market roads, water systems, health stations and day care centers among others. This development, he believes, has an impact to the town’s reduced poverty incidence from 53% in 2010 to 43% last 2015. Further, Mayor Orfanel said that the transparency principle of the program shaped the residents to trust again and work closely with the LGU in the implementation of community projects. Since the people are involved and can oversee all transactions and activities, they are ensured of a corruption-free project implementation. For instance, volunteer bookkeeper Myla Retardo from Brgy. Tagabas Ibaba was engaged in the monitoring of their project’s budget. Together with other volunteers, they also share financial status to the residents so they know where the money is being used. “Kung ang programang isinusulong ng LGU ay kaduda-duda, hindi rin naman susuporta ang mamamayan. Kaya nagkaroon ng pag-unlad dito sa amin ay dahil nagtulungan at nagkaisa ang mamamayan at LGU,” Myla shared. With this, Mayor Orfanel is thankful that Kalahi-CIDSS helped them break labels on politics. “Binasag ng Kalahi-CIDSS ang nabuong imahe ng pamumuno, ang imahe ng korapsyon at katiwalian. Dito, natulungan kaming ipakita na hindi lahat sa pulitika ay may anomalya. Kalahi helped us promote good governance,” Mayor Orfanel said. With the good performance of the LGU and the people of Catanauan, the municipality received an incentive grant from Kalahi-CIDSS last 2015 through the Makamasang Tugon modality. They are provided with PhP19.75 Million for the implementation of their prioritized projects this 2016. In this modality, the overall implementation of the program is run by the LGU following the Kalahi-CIDSS strategy. The DSWD, on the other hand, provides the grant for the construction of various community projects and technical assistance to the LGU. Further, Mayor Orfanel was recognized as the Best Municipal Local Chief Executive (LCE) in the Kalahi-CIDSS 2nd National Bayani Ka! Awards for successfully using the CDD strategy in his town. The Bayani Ka! Awards is an annual recognition of notable community volunteers and program partners who have actively promoted and participated in the CDD strategy of the program in their respective communities. Members of the Transportasyon Bayanihan sa Brgy. San Pablo Suba work together to finish their community store for their project of buying and selling crops under the DSWD’s Sustainable Livelihood Program. In a village where it takes almost a 10-hour hike to reach the town proper, progress seems to be as slow and as far. Residents have mastered the art of living simply—of which they describe as “isang kahig, isang tuka.” For most of them, being able to feed their hungry stomachs is enough reason to be contented. Today, however, this small village of San Pablo Suha in the town of Catanauan, Quezon Province has been showing signs of progress. And little by little, the residents are dreaming a better life not only for themselves but for the whole community. Most of the residents in the village may have been contented with ensuring food on the table; however, the coming of the Pantawid Pamilyang Pilipino Program in 2010 in the barangay gave most of the poor families an opportunity to dream bigger, especially for their children. “Hindi sapat ang kinikita ng halos lahat sa amin kaya hirap na hirap kaming magpaaral ng mga bata. Sa tulong ng Pantawid Pamilya, nagkaroon kami ng pag-asa dahil nasusuportahan na namin ang edukasyon ng aming mga anak,” said Leonora Javier, 44. To date, there are 161 household-beneficiaries of the program in the village. With more and more children going to school, even the non-beneficiaries of the program notice the change in the barangay. Gregorio Sanchez, 44, a native of the barangay, observes that the program has taught the parents to value the education of their children. “Kung wala siguro ‘yung programa, marami pa rin siguro ang hindi nakakapag-aral,” shared Gregorio. Melba De Rojas, 41, another Pantawid Pamilya beneficiary, said that seeing their children in school means a lot to parents like her. “Ang pangarap namin sa aming mga anak ay mas makaangat sila sa buhay, hindi katulad ng binibigay namin sa kanila ngayon na isang kahig, isang tuka. Gusto namin, kapag nagkaroon sila ng sariling mga pamilya, makakapagpaaral sila ng mga anak at makakakain sila nang tama sa oras kahit walang suporta mula sa gobyerno,” shared Melba. Their barangay’s geographic situation has also been a long time problem of the residents. According to them, despite the support of the government for their children, their location hampers progress of the livelihood of most families. Resident Marcelino Redoma, 57, shares that farmers like him usually spend a lot of time and money to bring their crops to the market, which leaves them little profit for their families. What he cannot forget, however, is how this situation took the life of his wife several years back. “Nagkaroon ng kumplikasyon sa panganganak ang asawa ko noon kaya kinailangan naming dalhin sa ospital sa bayan. Mga 30 tao kaming nagtulong tulong sa pagbubuhat sa kanya ng mahigit 10 oras. Pagdating namin sa bayan, huli na ang lahat,” Marcelino recalled. Gladly, they need not suffer from this kind of life anymore. In 2013, another program of the national government was introduced to the village—the Kapit-Bisig Laban sa Kahirapan-Comprehensive and Integrated Delivery of Social Services (Kalahi-CIDSS). In its implementation, they pushed for the construction of a farm-to-market road to improve access to their barangay. “Malaki na ang nabago sa aming barangay simula noong nagkaroon kami ng maayos na kalsada. Mas nadagdagan ang kita naming mga magsasaka dahil mas mura at mas mabilis na ang pagdadala ng mga produkto sa pamilihan,” said Melba. She also added that parents like her have found peace of mind because of the new road. “Kung may magkasakit man sa pamilya, madali na naming nadadala sa bayan dahil naaabot na kami ng sasakyan. ‘Yung mga bata ring pumapasok sa school, hindi na nila nararanasan ang paglalakad sa maputik na daan dahil p’wede na silang sumakay papuntang eskwelahan,” Melba shared. Besides the farm-to-market road project in 2013, the residents also implemented other projects such as the concreting of the critical section of the barangay road and spillway in 2015 under the Kalahi-CIDSS program. Both the Pantawid Pamilya and the Kalahi-CIDSS taught the residents that it is possible to change the course of their lives. “Sa FDS [Family Development Sessions], marami kaming natutunan hindi lang tungkol sa pagpapaunlad ng aming pamilya. Natuto rin kami na makipagtulungan sa barangay para sa iisang layunin,” shared Melba, who added that before, families seemed to care only for their household’s welfare. The FDS is a component of the Pantawid Pamilya program that teaches parent-grantees on various topics including strengthening marital relationships, budget management, children’s rights and disaster preparedness among others. Brgy. Captain Roberto Estrella Sr. also cited how the concept of ‘bayanihan’ has been exemplified in the barangay in the implementation of the Kalahi-CIDSS. “Para mas malayo ang marating ng pondo, sinabi ng mga residente na libre silang magtatrabaho para sa proyekto at iyon naman ay kanilang tinupad,” said Capt. Estrella. With this new perspective among the residents, they only have one goal now—that is to altogether taste a sweeter life. This, they are currently proving through another community project under the Sustainable Livelihood Program using the Bottom-Up Budgeting scheme. Called Transportasyon Bayanihan sa Barangay San Pablo Suha (TBBS), their association has been funded with PhP1,110,000.00 this February 2016 and caters to 130 beneficiaries, 80 percent of this are beneficiaries of the Pantawid Pamilya program. “Yung TBBS po ay samahan ng iba’t ibang asosasyon dito sa aming barangay katulad ng mga magsasaka, kababaihan at PTA [Parent and Teachers Association]. Napagkasunduan naming magtayo ng buy-and-sell ng mga produkto. Dito ibebenta ng mga residente ang kanilang mga produkto at kami ang magdadala nito sa pamilihan,” explained Gregorio, who was elected President of the association. The community business will also sell basic commodities such as rice for members and non-members alike. “Yung dating kanya-kanya, ngayon ay nagkakaisa na. Masarap sa pakiramdam na kami ngayon ay sama-sama sa tiyak na pag-unlad,” a positive Leonora shared. ***The three programs implemented in Brgy. San Pablo Suha are the core social protection programs of the Department of Social Welfare and Development (DSWD). The Pantawid Pamiyang Pilipino Program, Kalahi-CIDSS and SLP, through the DSWD’s convergence strategy, are all geared towards improving the living condition of poor families. The Pantawid Pamilya invests on the human capital through the provision of conditional cash grants in support for the health, nutrition and education of children age zero to 18. Meanwhile, the Kalahi-CIDSS helps improve access of poor communities to social services through engaging the local residents in identifying, planning and implementing need-responsive projects. The SLP, on the other hand, prepares families towards self-sufficiency through building their capacities towards micro-enterprise development or gainful employment. Most of the volunteers for the artificial coral reefs project are the fishermen of Brgy. Hagakhakin. Once the coral reefs are placed underwater and become a breeding place of marine species, the fishermen are hopeful for a regular bountiful catch to gain more income for their families. Back in July 2014, Adelfa Paulite cannot believe her eyes. All around her, she saw families with damaged houses and fishermen with destroyed boats after Typhoon Glenda hit their coastal community of Hagakhakin in the town of Gumaca, Quezon Province. For a community that relies on the sea, the aftermath of the typhoon means majority of them having to start all over again. “Mayroong halos 400 na kabahayan sa aming barangay. Sa bilang na ‘yun, 15 hanggang 20 kabahayan lang ang walang damage. Sobrang devastated talaga kami ‘nung panahon na ‘yun,” shared Brgy. Capt. Adelfa, 43. The Lamon Bay where residents fish as their primary source of living was affected. Coral reefs were damaged, which affected the catch of around 80 fishermen in the community. From almost a thousand pesos of income a day, their catch now only gives them PhP60 a day or worse, none at all. “Nasira ang kanlungan ng mga isda. Mahina ang kita sa dagat kaya kailangang magtrabaho na rin sa kabundukan para may mapagkunan ng panggastos sa pamilya,” said Exequiel Zamora, 69, the president of the fishermen association in the said village. Barangay Capt. Adelfa mentioned that they received relief assistance such as food and construction materials for their damaged houses. But more than these types of assistance, they know they have to work on having a stable income again. Thus, as a community, they pushed for a rehabilitation project through the construction of artificial coral reefs. The community residents of Brgy. Hagakhakin implemented the artificial coral reefs project through the Department of Social Welfare and Development’s (DSWD) Kapit Bisig Laban sa Kahirapan-Comprehensive and Integrated Delivery of Social Services (Kalahi-CIDSS) program. This project is a first of DSWD Kalahi-CIDSS in the CALABARZON region with the aim to promote environmental protection and sustainable development of natural resources. Here, the community was provided with PhP833,835 grant and volunteers were organized and trained on project proposal development, construction estimates and procurement to implement the project. The volunteers took charge on the processing of the needed documents, canvassing of the construction materials, and consulting project developers from other towns who have implemented such kind of project. “Talagang ninais naming makiisa sa proyekto dahil para sa amin din naman iyan, kami rin ang lubos na makikinabang,” said Exequiel, who also acted as a volunteer timekeeper and caretaker of materials during the construction of the coral reefs. Also, some residents were hired as laborers for the project for PhP250 a day. According to Exequiel, this has given them a short-term source of income for their families. “Kumita na agad kami kahit hindi pa man nailalagay ang proyekto sa dagat. At mas masisiguro pa ang pangmatagalang kita, kapag nailagay na namin iyan,” added Exequiel. Sixty three units of artificial coral reefs are ready to be submerged in the waters to serve as new home to marine species in typhoon-damaged coastal community of Hagakhakin in Gumaca town, Quezon Province. To date, the community volunteers have constructed a total of 63 artificial coral reefs. They are just waiting for the ideal season to ferry the coral reefs into the waters and put them in place. “Lalagyan ‘to ng mga kawayan at drums sa gilid para lumutang. Magagawa lang naming hilahin ito papunta sa dagat kapag mataas na ang tubig. Kaya hinihintay namin ang full moon at new moon kung saan tataas ang tubig para maisagawa na ito,” explained Exequiel. On the other hand, Brgy. Capt. Adelfa is certain on the positive outcome once the coral reefs are installed in the sea. “Base sa karanasan ng ibang bayan na gumawa na ng ganito, one year lang at lulumutin na ang mga corals tapos titirhan na ito ng mga isda. Makikinabang na agad ang mga mangingisda namin,” she shared. As part of the barangay council’s counterpart, Brgy. Capt. Adelfa mentioned the creation of an ordinance declaring the area as a fish sanctuary. Fishing boundaries will be made to preserve the area and coast guards will be posted to monitor the fishing activities. Eugenio Tierra, 53, a fisherman in the village and also a volunteer of the project, shared his excitement on the project’s potential. “Kahit ‘yung mga susunod na henerasyon, pagdating ng araw, pakikinabangan pa rin nila ang proyekto kaya’t napakahalaga sa amin niyan,” said Eugenio. A father of 10 children, Eugenio admitted that it was hard to make ends meet with the small income he earns now from fishing. He believes that the project will soon give them again a stable income, which is important to feed his family. For him, this will also prove his determination of giving his family a good life and not simply relying on the grants they receive as a beneficiary of the Pantawid Pamilyang Pilipino Program. As a beneficiary of Pantawid Pamilya, another DSWD program, Eugenio’s family receives PhP1,600 a month in support for the children’s health, nutritional, and educational needs. Before they receive the grant, his family must ensure that they comply with the conditions of the program including attendance to monthly health check-ups and Family Development Sessions among others. “Malaki ang pasasalamat namin sa gobyerno dahil sa Pantawid Pamilya pero alam naming tulong lang iyan. Dapat pa rin kaming magtrabaho at kumita para sa aming pamilya. Kaya malaki talaga ang magagawa ng proyekto namin sa Kalahi para sa pangkabuhayan namin,” Eugenio added. With the dedication and bayanihan of Exequiel, Eugenio and the rest of the community volunteers for the project, Brgy. Capt. Adelfa cannot help but be proud of her barangay. “Pinapahalagahan ko yung sistema ng Kalahi na hinihimok ang komunidad na magtulungan at magdesisyon para sa proyektong pambarangay. Nagkakaroon ang mga tao ng ownership sa proyekto. Dahil sila ang gumawa at sila rin ang makikinabang, nandoon ‘yung puso para sa proyekto,” she added. Modern day hero. Catanauan Mayor Ramon Orfanel (right) proudly receives the award as Best Municipal Local Chief Executive in the Kalahi-CIDSS 2nd Bayani Ka! Awards from DSWD Undersecretary Camilo Gudmalin (left) during the awarding ceremony last February 9, 2016. The Department of Social Welfare and Development (DSWD) awarded Mayor Ramon Orfanel of Catanauan, Quezon Province as the Best Municipal Local Chief Executive (LCE) in the 2nd National Bayani Ka! Awards for his contributions and support in the implementation of the Kapit Bisig Laban sa Kahirapan-Comprehensive and Integrated Delivery of Social Services (Kalahi-CIDSS) program. The Bayani Ka! Awards is an annual recognition of notable community volunteers and program partners who have actively promoted and participated in the community-driven development (CDD) strategy of the Kalahi-CIDSS program in their respective communities. Since the start of the Kalahi-CIDSS implementation in the town of Catanauan in 2010, Orfanel has been supporting the program by leading technical reviews of project proposals with community volunteers, visiting and monitoring communities during sub-project construction and providing beyond the needed cash and in-kind counterpart for the program implementation. “Bilang Mayor, ang alam ko lang dati ay ang salitang ‘I’ sa pagsasagawa ng mga proyekto sa aming bayan. But because of the thrust of Kalahi-CIDSS to empower the people, I have learned the power of ‘we’ in effectively improving the town of Catanauan,” said Orfanel in his acceptance speech during the awarding ceremony last February 9, 2016. Other awardees recognized during the ceremony were Marcelo Gusanan from Sultan Kudarat (Best Volunteer), Narcissa Paraso from Nueva Ecija (Best Barangay LCE), and Governor Arturo Uy from Compostela Valley (Best Provincial LCE). DSWD Undersecretary Camilo Gudmalin acknowledged the awardees for exemplifying the Bayani spirit of giving more of themselves for the development of their communities. “We are thankful that you are giving a chance to make democracy come to life. Let us work together to get communities out of poverty,” said Undersecretary Gudmalin in his message to the awardees. The Kalahi-CIDSS is a poverty reduction program of the DSWD that follows the CDD strategy which empowers local residents to get involved in the development process of their communities. It also aims to improve local governance by influencing leaders to practice engaging ordinary citizens in the decision-making and implementation of projects for greater transparency and accountability of community projects. Since the start of the Kalahi-CIDSS implementation in Catanauan, there are already 214 completed community subprojects including farm-to-market roads, school buildings, health centers and water systems, which addressed the most pressing needs of poor communities in the said town. Fe Oronan, a Kalahi-CIDSS volunteer, is proud that despite being an elderly, she is still able to serve her community. For 66-year-old Fe Oronan, serving the people is her life’s inspiration. Despite her age, she still has the strength to juggle several responsibilities because of the contentment she feels in helping their community. “Malaking bagay ang makatulong sa kapwa. Kaya ang pagkakataong makapaglingkod ay malaking biyaya para sa akin,” said Fe, a resident of Brgy. Calimpak in Guinayangan, Quezon Province. Fe is a volunteer health worker in their barangay for 25 years now. She is also a member of the community health team where they monitor the health of poor families and ensure that they avail monthly health check-ups and other medical services. She also became a barangay councilor of their coastal village for eight years where she was exposed to their community’s needs and problems. For her, it is also being of service to the community that she finds more opportunities to help. All her life, she has seen the need of an evacuation area for the residents of their coastal community in times of disasters. “Halos 500 na pamilya ang nakatira sa tabing dagat at kailangang lumikas tuwing may bagyo. Sa school at sa barangay hall sila nagpupunta pero hindi naman sila lahat kasya ‘dun,” shared Fe. Last 2014, Fe could not hide her happiness when she found an opportunity to help the community in a different way. She suggested and led a project to address this long-time community need when the Department of Social Welfare and Development’s (DSWD) Kapit Bisig Laban sa Kahirapan-Comprehensive and Integrated Delivery of Social Services (Kalahi-CIDSS) program started in their community. Together with other community volunteers, they implemented a community center sub-project. While they are implementing the project, Fe appreciated the Kalahi-CIDSS’ process of consulting and engaging the community residents starting from the planning up to the construction of the community center. They underwent trainings on proposal development, financial management and procurement to gain knowledge and skills in managing the project. With these activities, Fe felt that the government has given them trust and is guiding them in executing the PhP1.40 Million project. In return, Fe made sure that they perform their tasks well. As the head of the volunteers, she regularly held meetings with the volunteers and monitored every transaction from the canvass and procurement of materials to the hiring of good laborers and timekeeping during construction. She wanted to ensure that the grant provided to them is properly utilized. “Lagi kong sinasabi sa kanila na kahit ako ay may edad na, sa abot ng aking makakaya ay sisikapin kong magampanan ang aking tungkulin bilang head ng volunteers sa aming baranggay,” shared Fe. She also solicited support from their barangay council in the construction process. 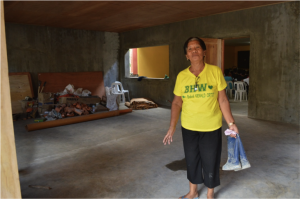 More than she expected, the council helped in the construction work for free, with their barangay officials shouldering the snacks for all the workers. “Paraan daw po iyon ng pasasalamat ng sanggunian dahil natugunan ang pangangailangan ng mga tao nang hindi na kailangang ibawas pa sa budget ng baranggay,” said Fe. This December 2015, the construction of the 126-square meter-community center is already completed. They are now procuring chairs, cabinets and other furnishings to make it fully functional by next year. Aside from her responsibilities in the community, at home, Fe is a grandmother to Dexter Amil, 12, and Danielle Ann, 9. Fe’s daughter, the mother of the two children, works in Lucena City to help sustain their needs. Both her grandchildren are beneficiaries of the Pantawid Pamilyang Pilipino Program, another program of the DSWD providing conditional cash grants to poor families to support the needs on health, nutrition and education of children age zero to 18. As the guardian of the two, she attends monthly Family Development Sessions and ensures that her grandchildren avail monthly health check-ups and meet the 85% monthly school attendance. The cash grants, according to her, helps in meeting the educational and health needs of the children. “Malaking tulong din talaga sa amin ang Pantawid dahil bukod sa padala ng anak ko, kumikita lang din ako ‘pag may sideline na labada. Napakahalaga ng grant na natatanggap namin para sa mga pangangailangan ng mga apo ko,” she shared. With all these tasks at home and in their community, Fe admitted that she gets tired sometimes. But for her, this is also an affirmation of her purpose in life—that is to serve. “Kahit ako’y nahihirapan, nand’yan naman si Lord. Binibigyan niya ako ng lakas ng katawan para gawin ang lahat ng ‘to. At masaya naman ako at nagpapasalamat dahil may nagagawa pa rin ako kahit matanda na ako,” said Fe.